ZHUHAI, China (Reuters) - China paraded industrial and military clout and sent deliberate signals to Western rivals that its aerospace and arms industries aim to catch them up on world markets, while playing down trade tensions at the nation's largest air show this week. 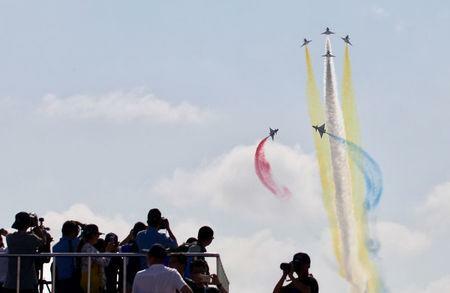 The biennial event in the coastal city of Zhuhai has traditionally been used by Beijing to show off its growing aviation capability, but is also keenly watched by the global industry for clues on where it faces obstacles. Beijing not only showed off a range of new military kit for export, but unveiled progress in civil wide-body and regional jet programs and deeper cooperation with Russia in a message to the West, industry watchers said. "You get a real sense of the scale and speed of the development of the past 25 years. They have covered an enormous amount of ground in a really short space of time in terms of defense and aerospace," said Douglas Barrie, senior fellow for military aerospace at the London-based IISS thinktank. "Everything we have been shown here is pretty much for the export market. You then wonder what isn't being shown; what are they keeping for themselves in terms of capability?" On display in the sprawling 'weaponry hall' and on other stages to military visitors from Africa to Southeast Asia were ground vehicles, drones ranging from miniature to aircraft-sized and new anti-ship ballistic missiles. China's new J-20 stealth jet performed a five-minute-long demonstration - in contrast to a prudent 60-second debut two years ago - though the jet is not expected to be sold overseas. The show has been taking place against a backdrop of a tariff spat with the United States and U.S. accusations of espionage by China's state aerospace apparatus. Chinese President Xi Jinping said weeks before the show that Russia and China should work together to oppose protectionism and what he called unilateral approaches to international problems, a veiled reference to U.S. foreign policy. The two countries unveiled a mock-up of the CR929 wide-body civil jet, widely seen as a high-level initiative, and signed a helicopter sale in one of the few deals. A senior executive at Russian state conglomerate Rostec told Reuters both countries were keen to develop their civil aircraft building capabilities to reduce their dependence on the Western companies that currently dominate the supply chain. "The Chinese-Russian aircraft is showing that they have a choice, that they don't have to buy (aircraft) from the West and that if there are any problems on trade they can develop perfectly adequately in cooperation with Russia," said aerospace analyst Sash Tusa of Britain-based Agency Partners. Helping efforts to showcase the strides China is making in aviation was Commercial Aircraft Corporation of China (COMAC), which wants to become a serious competitor to Boeing and Airbus and regional jet players Canada and Brazil. Three of its self-developed ARJ-21 regional jets, decorated in the liveries of customers including Genghis Khan Airlines, flew demonstrations in a performance some analysts said indicated that the problematic program was turning a corner. COMAC's General Manager Zhao Yuerang told a news conference attended by Chinese government officials that the company now plans to deliver 100 ARJ-21 planes within the next five years. "We have smoothly passed the difficult teething period that every new plane model has to face," he said. Some industry executives, however, said it was difficult to ignore some glaring holes in China's carefully orchestrated show of strength, noting attendance numbers appeared to have fallen. It took place in the same week as a Shanghai import expo, viewed as one of China's most important foreign policy events for the year. Hong Kong's South China Morning Post (SCMP) reported, citing military insiders, that organizers had scaled back the Zhuhai event due to trade tensions and reduced funding. There were also a number of no-shows among the range of domestic products that China was expected to put on display. In a separate report, the SCMP reported the WS-15 Emei engine for the J-20 fighter was not used as had been expected. COMAC did not bring its banner product, the narrowbody C919, which has been in flight tests for over a year. COMAC officials said its two C919 planes were busy flight testing. A senior industry executive called this a deliberate "PR strategy" to focus attention on the CR929 and its wider political message of joint Chinese-Russian resilience to U.S. pressure. But others said it was hard to escape the narrower explanation that the program itself was under strain. "This does not reflect terribly well for the country’s broader ambitions in this field," Tusa said.